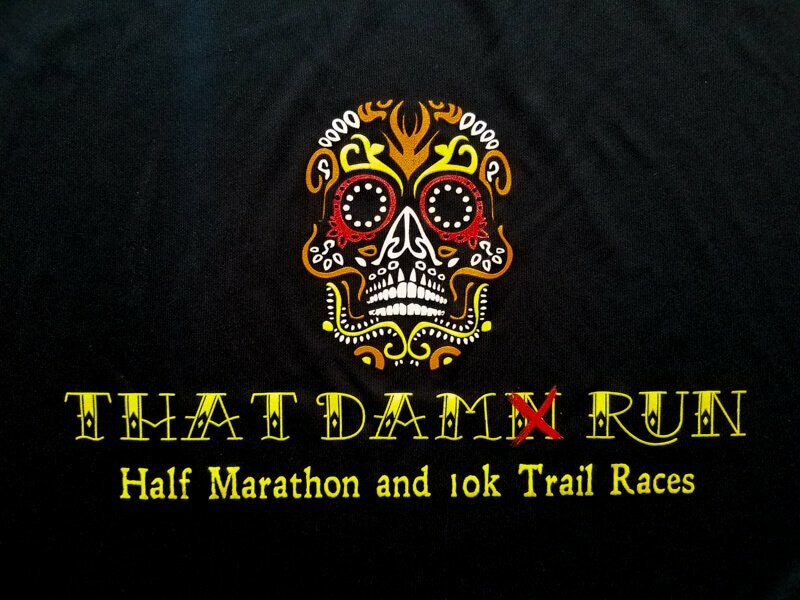 I did That Damn Run a few years ago and remembered liking it, although I didn’t remember many specifics, only that I liked (and still like) the shirt and the name of it makes me chuckle. It’s held at Cool, California, about a 2-hour drive from me out towards Tahoe. I was in the mood for a fall weekend getaway, so I thought I’d make a return trip. I ended up making this a weekend of trail running. 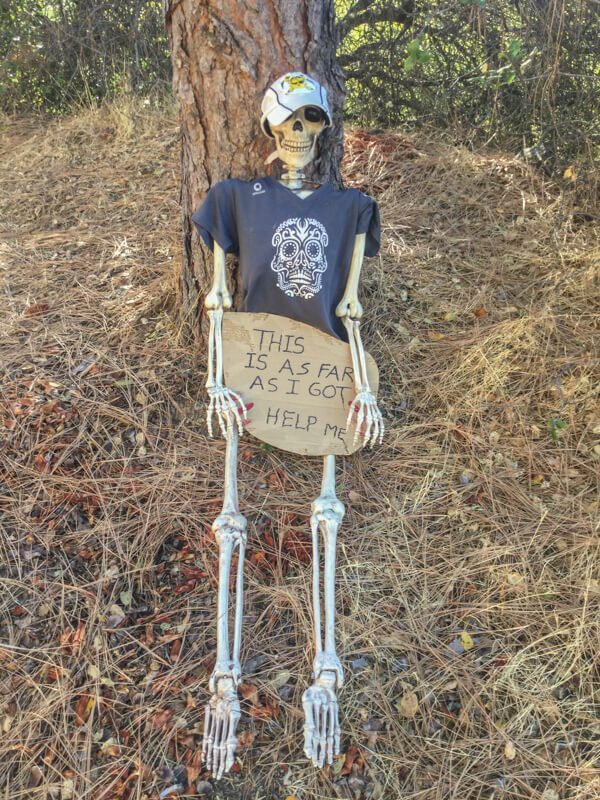 Saturday, I was an aid station volunteer at Brazen Goonies. I have a warm spot in my heart for Goonies, it was the site of my first age group win during the great trailpocalype of 2012, my proof that the worst conditions can lead to the best races (after the fact, anyway), if for no other reason than their storytelling and community building potential. When I run into other runners who raced in 2012, all we need to do is share a look and know we share something. 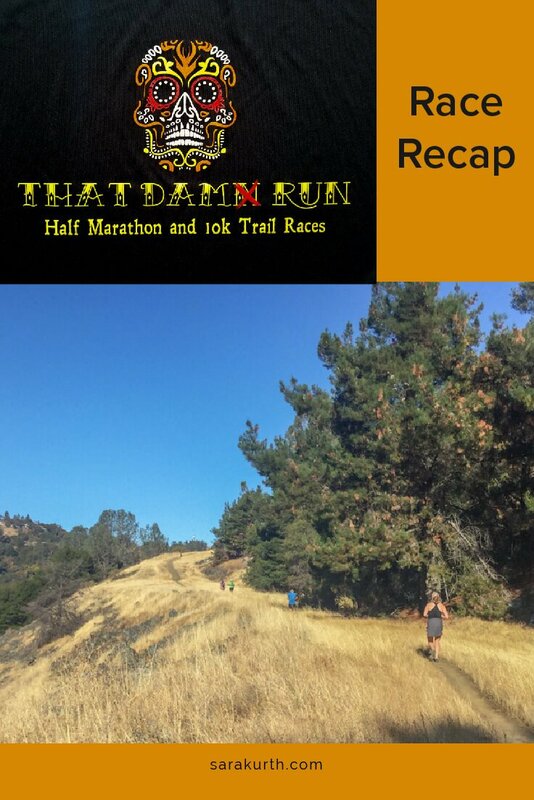 The second part of the weekend was That Damn Run. 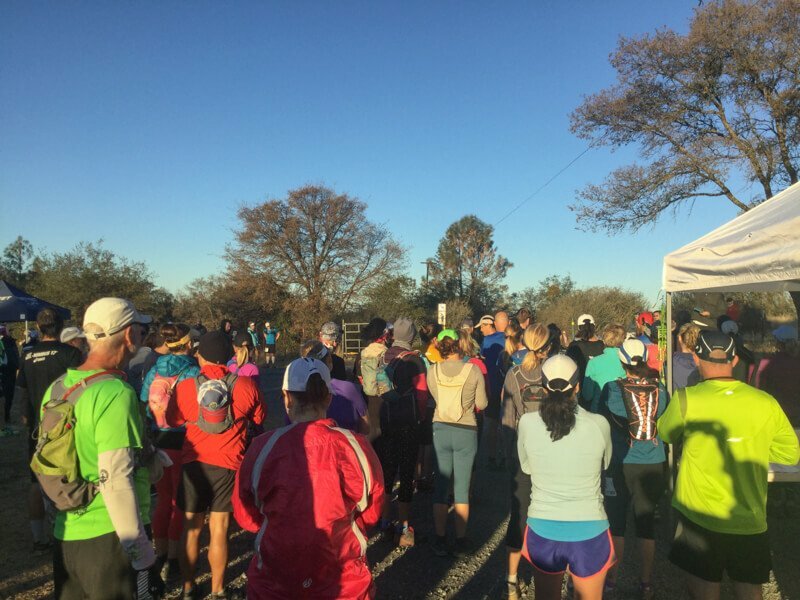 Incidentally, That Damn Run is on many of the same trails I ran for the Miner’s Revenge Trail Marathon in 2015, which is one of my other favorite races stories: the only time I can say I came in 15th overall! (I often conveniently omit that there were only 17 finishers). 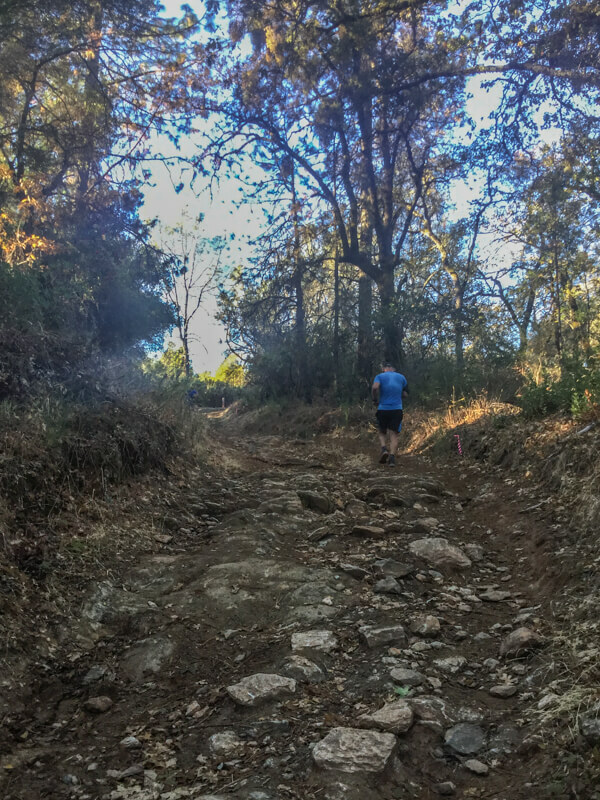 It turned into a weekend to revisit favorite trail running memories. I have no expectations or goals for this race other than to have fun. I’ve run exactly zero miles since I finished the Skyline Marathon a few weeks ago. First I took a few days off as rest, then the Napa fires created terrible air quality, so I stuck to indoor strength workouts with minimal cardio. Then I just got lazy. Hopefully, my race volunteering on Saturday will generate enough good running karma to get me through. As a Lutheran, this makes me chuckle every time I pass though Cool. 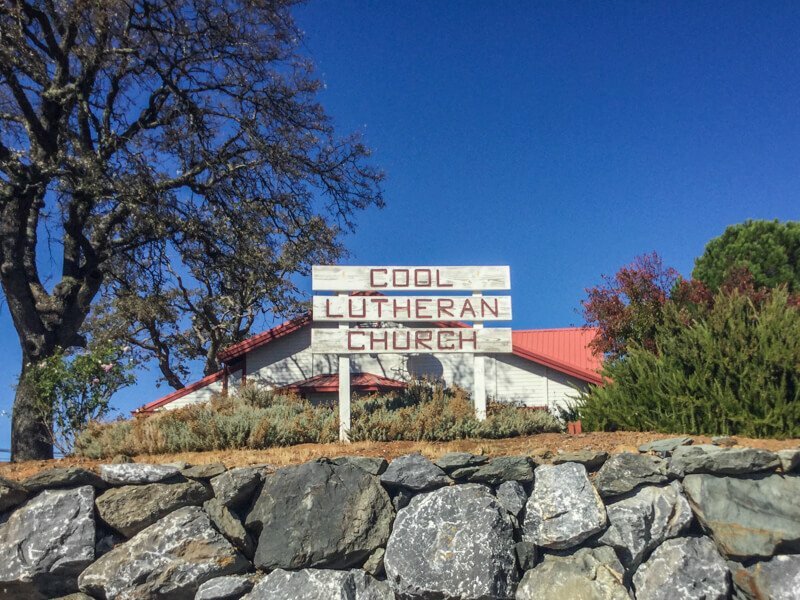 ‘Cool’ and ‘Lutheran’ don’t immediately belong next to each other in my mind. Most hotel options are in Auburn, a 20-minute drive from Cool. I’ve raced a few times out there and like the Golden Key, if for no other reason than the breakfast bar opens at 5:30! I can actually get a hot breakfast on race day! I can’t resist Belgian Waffles, so why start now? They still have carbs, right? With a heavy heart, I passed on the whipped cream and sprinkles they offer as toppings, tempted as I was. That would have been a step too far for a pre-race breakfast. 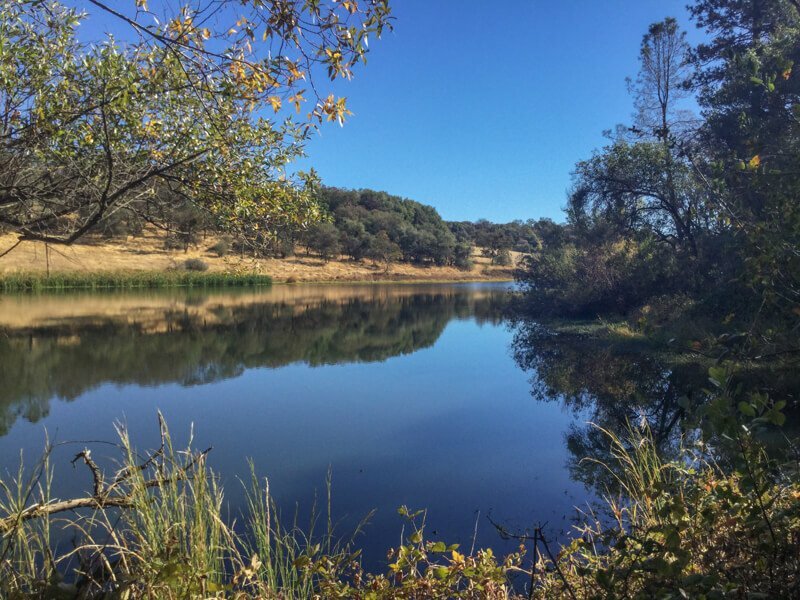 Saturday was perfect fall trail running weather, upper 60s, clear blue sky, just a touch of breeze. Sunday’s forecast was for more of the same. It turned out to be the widest range of temperatures I’ve had in a single morning. It was 43 and nippy when I arrived, and maybe 50 when the race started. As we ran it was cool (if not cold) in the shade, but would warm up maybe 20 degrees when we hit a sunny section. The day kept getting more beautiful as the day went on, with just a touch of (pine scented) breeze, keeping it from getting too hot. The day was picture perfect and what trail running dreams are made of. This is a small race, 76 people had pre-registered for the half and the related 10k, which is my ideal size for a race. Enough so I’m not too far out of sight of other people (good reassurance that I’m not off-course), but few enough that I never have to fight a crowd. As it turns out, getting off course was a total non-issue, the course was really well-marked. I decided at the last-minute to wear my calf compression sleeves. I’m not sold on compression’s effectiveness on the run (though I do find they help with recovery), but for this race, it wasn’t the compression effect I wanted, but 1) the extra touch of warmth for the morning chill and 2) protection against poison oak. Fall is when I tend to get the most eaten up by poison oak, and I could remember how much there was in this part of the world (some, but not too much as it turns out). One of the three aid stations was Oktoberfest themed, complete with polka music, sort-of costumed volunteers (they had aprons that looked like lederhosen) and three kinds of beer: regular, root, and ginger. The course was unusual for me in that it starts near the highest elevation, then drops down, then climbs back up. Much of the lowest areas have been quarried and mined over the years, leaving me wanting to research the history of the area more. Parts of the course were super rocky, so I really had to watch my footing so I didn’t twist anything. Bears were sighted the day before the race, as the course was being marked. I kept my eyes open but didn’t see a single bear. I’m not sure if I’m happy or disappointed by this. The only ‘negative’ (and I use the term loosely), is that many (most?) of the runners knew each other from local running clubs. While they were very nice and welcoming to those of us who were not part of the club, I did feel a little bit like a third wheel: The outsider who is one of the few who can’t greet everyone (or be greeted) by name. Both races I was involved in this weekend had black shirts, which I guess shouldn’t be too surprising so close to Halloween. I can’t figure out what to do with black tech shirts. I don’t like wearing them when it’s warm and sunny (the black material gets too warm), but if it’s cold, I won’t be wearing a short-sleeved t-shirt. This was just a great morning across the board. 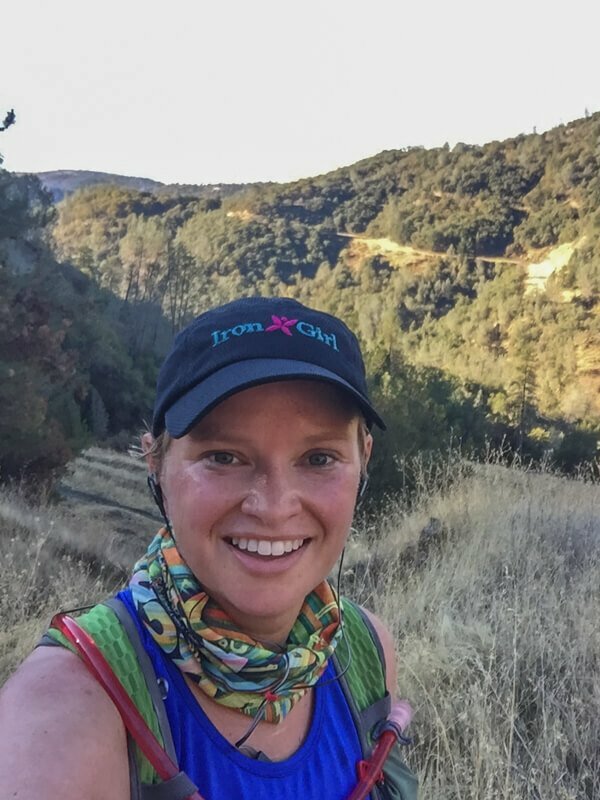 It helped that I felt great – maybe I should try not running in the two weeks before the race more often. I hung out in Auburn a little bit after the race. Ate lunch at a little outdoor creek side cafe. Auburn is a historic little town, I love the vibe of the place, with its old brick buildings and narrow streets. Many of the buildings are from the 1880s, according to their little informational plaques (which I read, of course, because I’m a lover of minutiae – it’s what I do). Just an amazing fall day all around. Would I Do That Damn Run Again? It is a bit of a trek to get out to Auburn and Cool, made worse since you have to fight the traffic of people heading out to Tahoe and Reno, but it makes for a good weekend getaway. I have nothing on the race calendar! Nothing at all! I’ve started looking around for my next big (or little) race, nothing yet has struck my fancy.